Jon Stewart, host of the Emmy and Peabody Award-winning "The Daily Show", and his coterie of patriots deliver a hilarious look at American government . . . 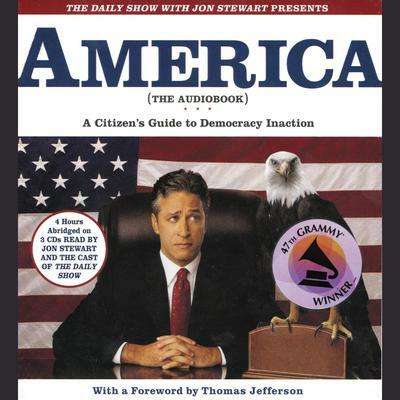 Termed a "political king-maker" by Newsweek, and "the Dan Rather of infotainment" by Vanity Fair, Jon Stewart, along with the writers of "The Daily Show", combines his riotous wit and razor-sharp insight in this hilarious book.American-style democracy is the world's most beloved form of government, which explains why so many other nations are eager for us to impose it on them. But what is American democracy?In America (The Book), Jon Stewart and "The Daily Show" writing staff offer their insights into our unique system of government, dissecting its institutions, explaining its history and processes, and exploring the reasons why concepts like "One man, one vote," "Government by the people," and "Every vote counts" have become such popular urban myths.